The business of the 35th Asian Racing Conference closed with two fascinating final sessions dedicated to Racing and Breeding in Mainland China. Kim Mak, Executive Director, Corporate Affairs of the Hong Kong Jockey Club, makes a presentation on the general landscape of horse racing and breeding in China. 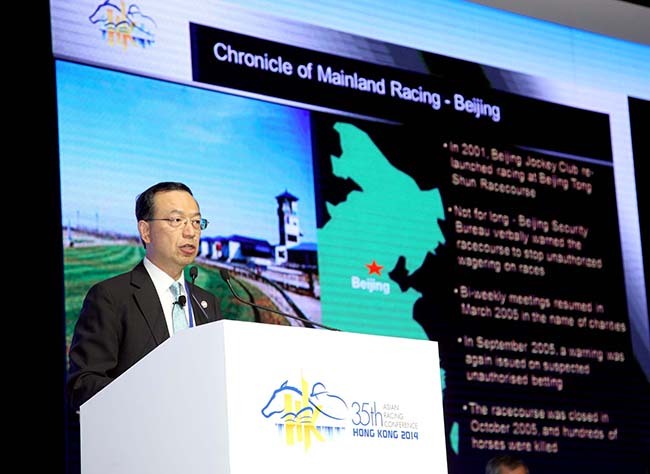 The first of these sessions, chaired by Asian Racing Federation Chairman Dr Koji Sato, commenced with an overview of horseracing in Mainland China over the past 20 years, presented by Dr Kim Mak, the Hong Kong Jockey Club’s Executive Director, Corporate Affairs, summarising the key racecourses and racing clubs that have emerged, and in some cases subsequently closed. And Dr Kyo Shimizu of the JAIRS Registration Department told attendees about the need for education in China regarding thoroughbred registration. Madam Tian spoke of the Chinese Government’s approach to the international development of horse racing and outlined the official structure under which horse racing is organised in China, with the sport coming under the jurisdiction of the China Equestrian Association, the officially permitted body under the auspices of China’s General Administration of Sport (GAS). “The sport has already become a key project in the development of Chinese sport and has gathered support from the government,” she said. 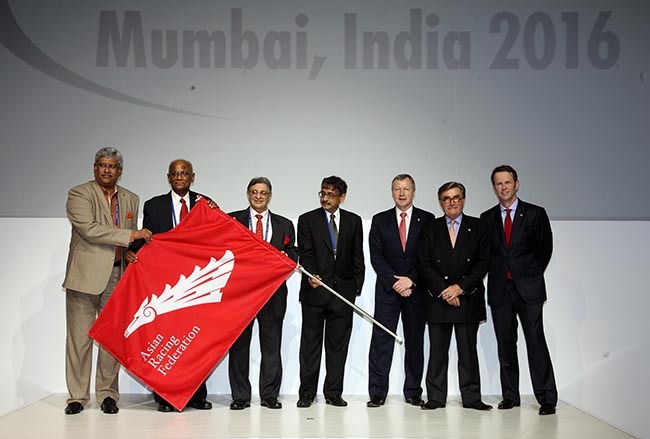 “The CEA aims to enhance the regulatory and technical standard of Chinese equestrians; promote the link among all members and deepen the friendship between the CEA and equestrian associations from around the world, and cooperation with the ARF and other international associations,” added Madam Tian, who also told delegates that China would wish to engage with the industry to improve infrastructure, including the training of participants. Professor Han Guocai, Vice Chairman of the China Horse Industry Association looked at the history, current situation and future outlook for the horse industry in China. He told delegates that China had 29 indigenous breeds; 13 new breeds since the 1950s and 10 imported breeds, including about 3000 thoroughbreds, of which about 400 had been registered in the China Stud Book. He noted that China had 16 racetracks with sufficient facilities to host horse races. At the session, Dr Chris Riggs, HKJC’s Head of Veterinary Clinical Services, gave attendees an insight into the equestrian veterinary landscape in China. In outlining the current challenges, he noted the lack of qualified vets, their low status in Chinese society, and the dearth of necessary clinical facilities, as well as the absence of drugs, and the regulatory restrictions that hinder the involvement of overseas vets. But he also noted some positive developments, including among other things, the commitment of dedicated young vets on the ground. “The Hong Kong Jockey Club has a genuine wish to support horse welfare in Mainland China, develop relevant skills and share our skills and knowledge,” he said.